Apple today announced that it will hold its annual World-Wide Developer’s Conference from June 2-6. Apple’s conference, held specifically for developers, is the primary venue where the company shows off it’s latest software. Last year, Apple announced iOS 7, Mavericks, and the Mac Pro. 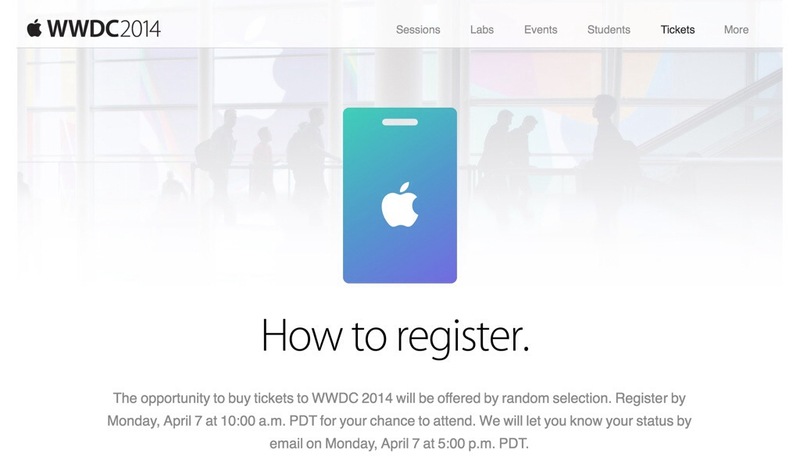 Tickets for this year’s WWDC will be distributed in a different method. In previous years, the conference sold out rapidly (only 72 seconds last year). Apple is using random selection this year to increase the opportunity for developers. Google’s annual I/O conference is also following a similar fashion. This year, Apple touts design more than ever, with a colorful new banner (see above). The company emphasizes design, games, and new features such as iBeacons. Tickets are available right now for registration – developers can enter for a chance to get a ticket which will be randomly selected on April 7. This entry was posted in Apple, Breaking, iOS, Mac, Tech Industry and tagged iOS 8, Moscone West, OS X, OS X 10.10, San Francisco, WWDC, WWDC 2014. Bookmark the permalink. ← Announcment: April Fool’s Joke!